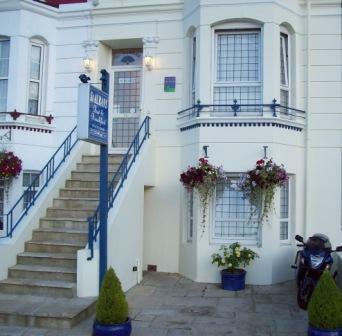 Hotel Dover England UK - Guest house offers Non-Smoking accommodation in Dover Kent - cheap ferry tickets, airport transfers. Victorian guest house built in 1869, we offer accommodation for people on the move. All rooms en-suite, non smoking, with a range of facilities including free WIFI internet access, Double & Twin rooms from £45, Singles from £35. For your convenience we're town centre located directly opposite Dover Priory railway station, perfectly situated for the ferry port, cruise terminal, the White Cliffs, historical attractions, breakfast cafes and restaurants, and just a short 10 minute drive to the Channel Tunnel. Taxi services to Dover port operate from Dover Priory train station. St Albans Guest House - 71 Folkestone Road, Dover, Kent, England, CT17 9RZ. Copyright © St Albans Guest House. All rights reserved.